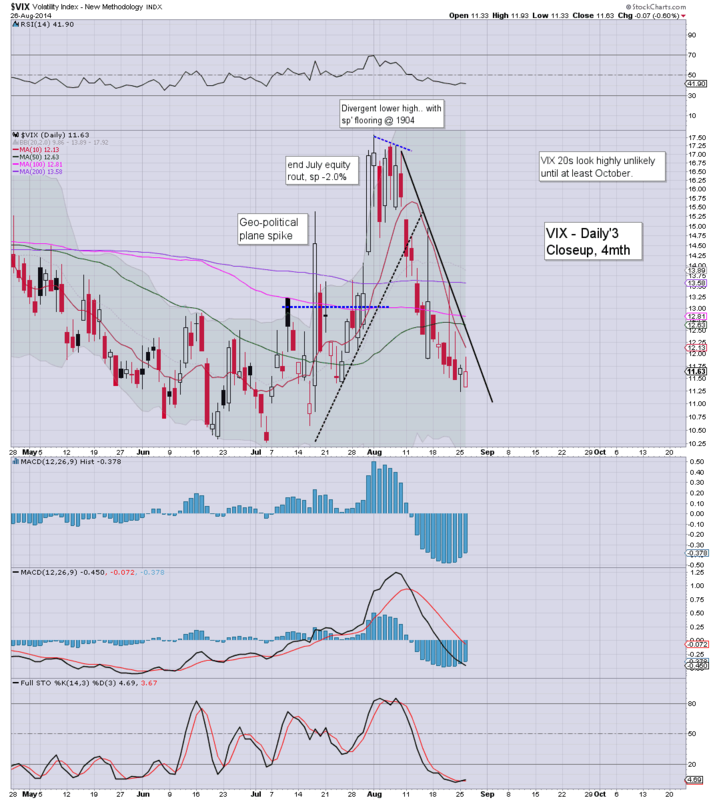 With equities continuing to claw higher, the VIX was back in melt mode, settling -0.6% @ 11.63. Near term outlook is for VIX to remain in the 13/10 zone. The big VIX 20 threshold looks unlikely to be challenged until at least October. VIX remains very subdued, and at best, equity bears might see the 14/15s...briefly, if a minor retrace of 1.5/2.5% or so. Regardless, I have ZERO interest in being long the VIX until late September at the earliest. 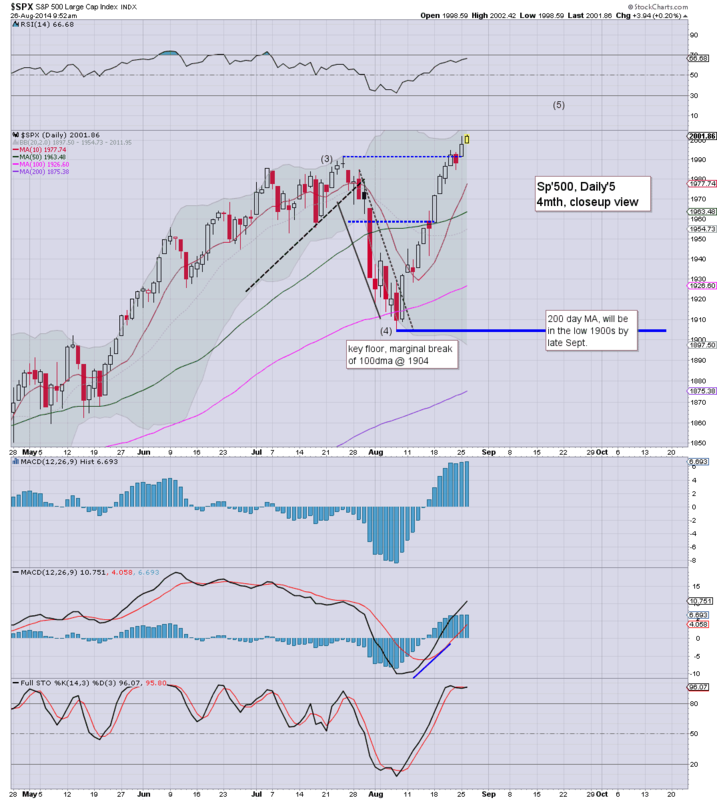 US equities closed moderately higher, sp +2pts @ 2000 (new historic high 2005). The two leaders - Trans/R2K, settled -0.4% and +0.8% respectively. 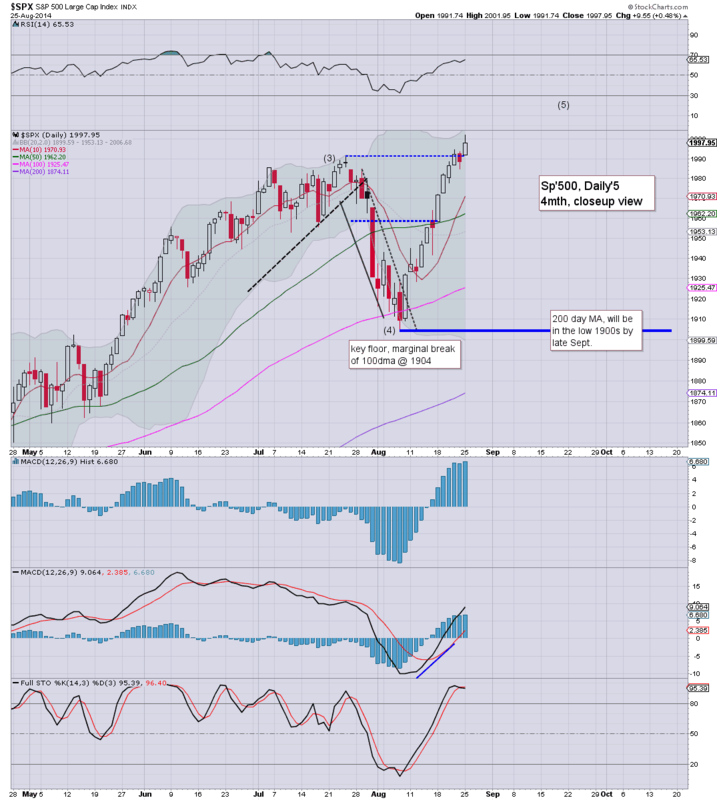 Near term outlook offers the 2010s to close the week/month. So.. a day of relatively minor chop.. but with the usual underlying upward pressure. The QE no doubt helped today..and there is another $1bn of that fuel tomorrow morning. We have a 3 day holiday weekend ahead, and volume will only get lighter. US equity indexes look set to close higher for the second consecutive day, and the 10th day of 13. Metals are holding moderate gains, Gold +$8. VIX is in melt mode, -1% in the mid 11s. *I am long SDRL from a little earlier, will hold overnight, and very likely into late Friday. Seeking a break into the $38s..and that should (in theory) lead to the $40 threshold. ...minor chop in the closing hour seems likely. Volume remains very low of course, and with a 3 day holiday weekend approaching..there seems little hope for those seeking a minor down wave back to the 1980/70s. 3.24pm... minor chop...and a close in the sp'2000s looks likely. Dow is around 30pts from breaking a new high..and that looks likely tomorrow morning. With metals managing moderate gains, GDX has fully reversed the Monday declines, +2.3%. US equities are seeing minor chop, but still all net positive for the day. With further QE of around $1bn tomorrow, equity bulls could easily control the rest of the week/month. Metals are holding moderate gains, Gold +$8. I just need a break through the 50 day...should then get to $40. RIG and DO are similarly on the climb. So... sp'2001/02.. with 2010 viable tomorrow. The only hope the equity bears have in the immediate term is GDP (due Thursday). A revision to the downside seems probable.. but a 3 day weekend is ahead..and that does not favour the bears. The giant monthly cycle on the Dow 'rainbow' chart has the first green candle since last December, and looks set for further gains next week/month. 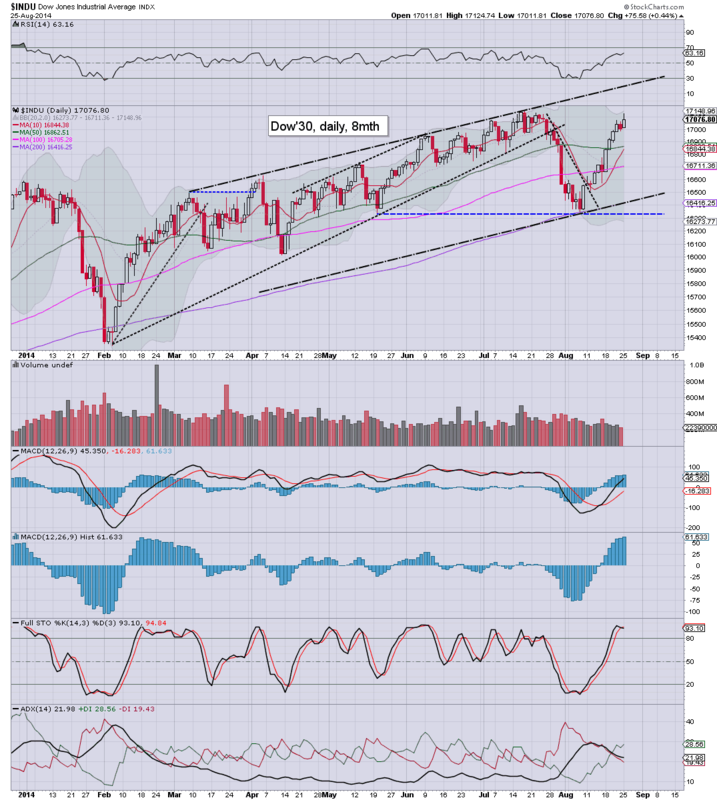 For those seeking sp'2050s, that probably equates to Dow 17500 or so. Other than that..it remains very quiet out there. Notable gains in the R2K, but I think I'll leave that for the next hour. 1.05pm.. A lot of chatter about the Oil/gas drillers, RIG is on the move, +2.7%. 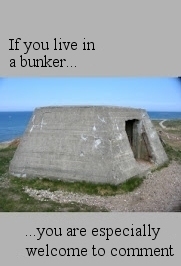 1.25pm.. I've my eyes on SDRL. 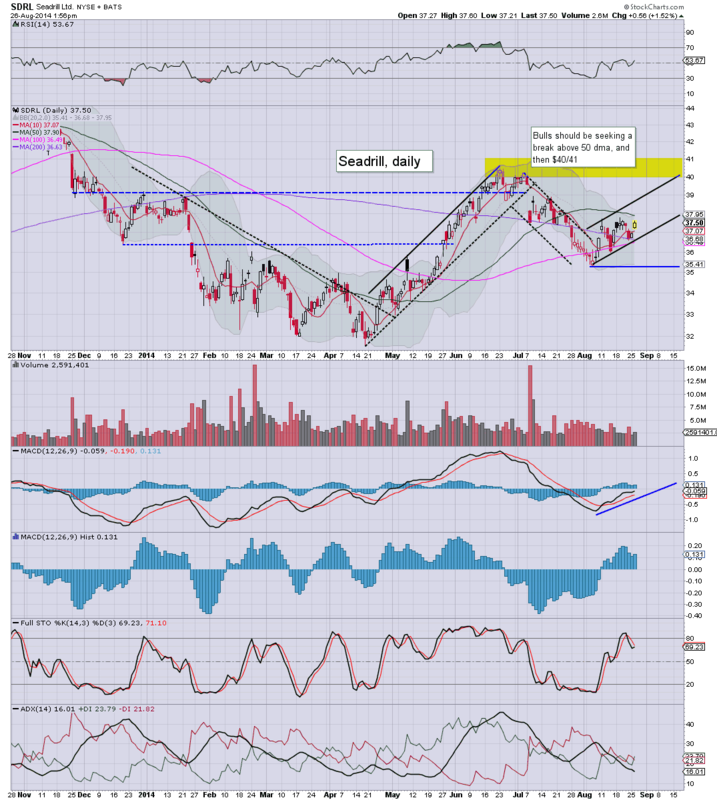 I've meddled in that a few times this year.. its in the $37s...weekly charts offer 40/41. Interesting company. US equities continue to melt higher.. if at an even slower rate... to sp'2005. There is viable upside to 2010/15 by late Wednesday. Metals are holding moderate gains, Gold +$8. VIX is holding the 11s, despite further equity gains. Little to add.. on what is an extremely tiresome day of QE fuelled algo-bot melt. 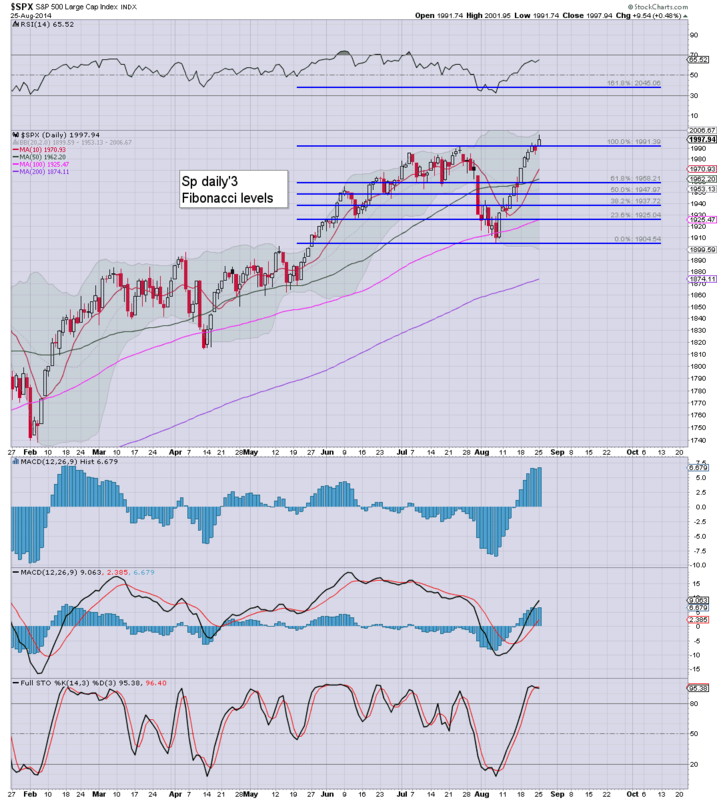 US equities continue to claw slowly higher to sp 2004. No doubt, QE fuel of a few billion dollars is going to help the bulls today.. and tomorrow. 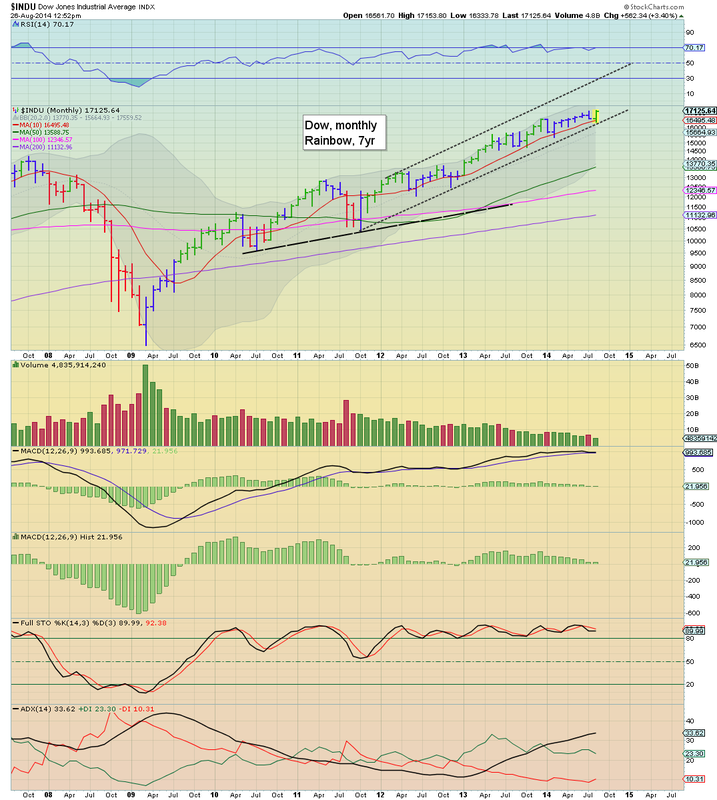 There is viable near term upside to 2010/15.. even 2020s by end week/month. It somewhat bemuses me how few are taking the QE issue seriously still. Yes..the volume is VERY low..its August after all... but that just helps the bulls of course. Note the upper bollinger on the daily cycle, now 2012, and likely 2014/16 tomorrow. This is classic algo-bot melt... grinding the bears into dust. 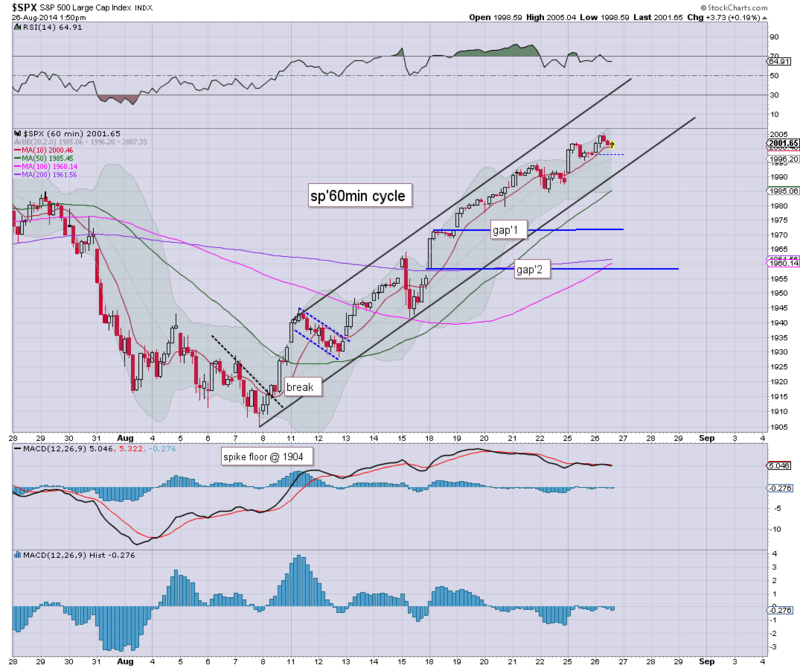 US indexes continue to push higher, with a fractional new high of sp'2002. With QE across today and tomorrow, the 2010/15 zone is viable in the immediate term. Metals are holding gains, Gold +$11. VIX is melting lower, -1.8% @ 11.49. *equity bears need to keep in mind, $3bn of QE across today/tomorrow...that will likely hold off any minor down wave for another day or two. 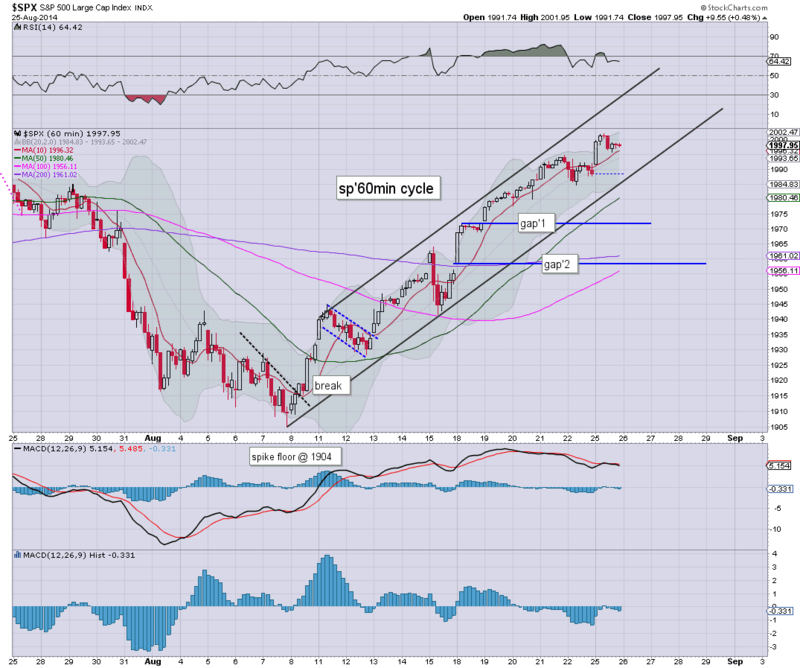 Note the upper bollinger on the daily cycle is now strongly turning upward..offering 2010 by the end of today. Tomorrow, 2010/15 will be very viable. 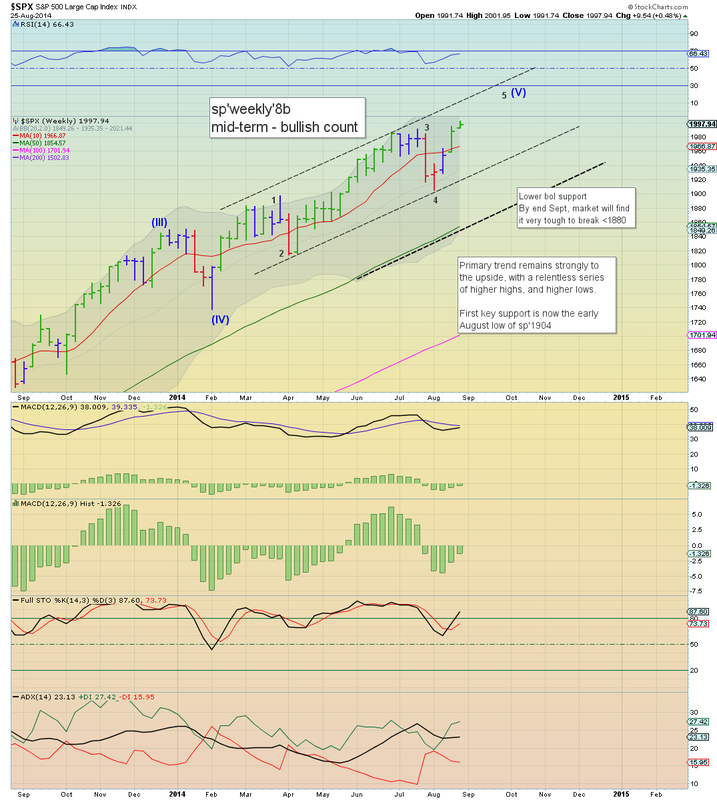 The bigger weekly cycles are naturally also offering ever higher upside... sp'2022. Notable strength: with precious metals on the rise, the miners, GDX +1.4%..reversing much of the Monday decline. Good morning. Futures are a touch higher, sp +1pt, we're set to open at 1998. Metals are on the rise, Gold +$10, with Silver +1.2%. Oil is moderately higher, +0.2%. With some QE today/tomorrow, equity bulls look set for further upside to 2010/15. First six minutes are new..rest is a cut/paste of yesterday. He is really in a mood against the doomer bears lately. 9.39am..and a new historic high of 2002.... the QE will kick in after 10am.... that will likely hold off any decline until later tomorrow. With the sp' breaking the giant 2000 threshold, the broader market looks set to continue pushing higher into next month. There looks to be reasonable upside to sp'2010/15 in the immediate term, and 2030/50 zone by mid/late September. So.. a second green candle on the weekly 'rainbow' cycle. On any 'fair' outlook, we'll surely close this week green, next week will be green, and maybe the first blue candle will appear around 2025/30 by mid September. The 2040/50 zone....would make for a very reasonable short term top. On the subsequent down cycle, bears should be seeking a re-test of the low 1900s, potentially forming a H/S formation. 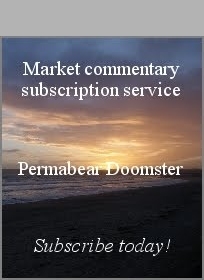 There are a few pieces of econ-data tomorrow, Durable goods orders, housing, and consumer confidence. *there is sig' QE of around $2.0/2.5bn...bears beware! Smooth sailing into end year? I've seen a lot of powerfully bullish outlooks across the past two trading days. Just last Friday, one guest on clown finance TV had upped his year end target from 1850 to 2300. Today, there were at least two guests touting the sp'2100s. Carboni and Riley are of course also seeking the 2100s. Given a few more weeks we'll top out (at least on the weekly cycles), but then what? A little drop of 50/75pts...or...perhaps more...to the 1900 threshold. What is now clear... equity bears need a break <1900 to cause some initial damage to the primary trend. ... all traders should be somewhat mindful of possible trouble this autumn. US indexes started the week on a positive note, sp +9pts @ 1997 (new historic high 2001). The two leaders - Trans/R2K, settled higher by 0.3% and 0.4% respectively. Near term outlook is for sp'2010/15 before a minor down wave.. probably beginning Wednesday. New historic highs in the Dow, Trans, and NYSE Comp' look likely within the near term. Only the R2K remains stuck, some 4.5% below the July high of 1213.